Explore the process of directing. This workshop introduces students to the specifics and process of directing – choosing a text to work with, adapting to the performance space, working with a design team, designers and crew. During the workshop students will explore how to transform a dramatic text into a theatrical production through creating a directorial concept, working with a group of artists (actors, designers & technicians) and using the elements of drama to make meaning on stage, from auditioning actors and managing rehearsals – all the way through to opening night and the season run. The workshop begins with an interactive presentation on the directorial process followed by a practical session where students gain first hand experience of this process from the perspective of the director. View our Directing resources here. Pitched at students’ level – completely relevant to where they are currently at. Michael’s approach was inclusive and encouraging. The workshop gave me more ideas on how to work with space and scripts. 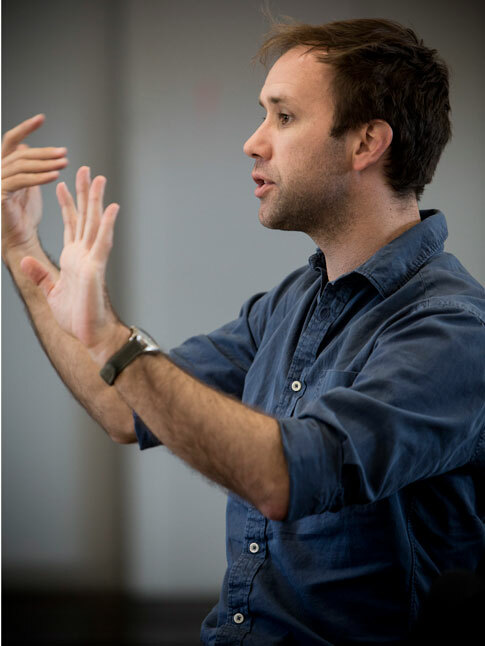 Eamon Flack in rehearsals for The Glass Menagerie. Photo: Brett Boardman.